The most extreme car in the manufacturer’s history, the Aston Martin Vulcan is a £1.8 million track-only hypercar powered by the most potent naturally aspirated car engine in production. Just 24 lucky individuals will get their hands on the Vulcan, a car that features a 7.0-litre version of Aston’s faithful V12 powertrain to create an output north of 800bhp. It is named after the same aircraft that was once housed at RAF Gaydon, close to the firm’s Warwickshire base and will rival both the McLaren P1 GTR and Ferrari FXX K.
As with any car of this nature, a great deal of development work has been undertaken to ensure the Vulcan is up the standards expected of a vehicle of this ilk. As a result, the car features a two-seat carbonfibre tub that is derived from the One-77, with 50 per cent of the tub being bespoke for the Vulcan. In creating the carbonfibre tub, Aston has made the Vulcan’s chassis stiffer and lighter, while a full FIA-spec roll cage has also been utilised. The car’s goliath engine has been mounted front-midship and has 50 per cent of it extending into the cockpit as a consequence. Aston Martin Racing has developed the 7.0-litre V12 which drives the rear wheels through a six-speed sequential gearbox derived from the Vantage GTE race car’s example. A top speed in excess of 200mph is anticipated, while Aston design chief Marek Reichman insists downshifts will encourage flaming exhausts “to make you stand up and notice”. The powertrain itself may very well be the last of its kind before Aston succumbs to turbocharging its engines in its next generation of models, including the breed of V12-powered names. Reichman also stated that the Vulcan represents the “visual language of our future sports cars”, while a “visceral driving experience” is also promised. The former of those statements likely mirrors the nature of the DB10 concept currently being used in the filming of the James Bond film Spectre. The aerodynamic nature of the Aston Martin Vulcan is combined with a honed carbonfibre body to create a dramatic exterior. Great attention to detail can be seen in the likes of the rear lights, where 27 individual light bars on either wing of the Vulcan make up the arrangement. 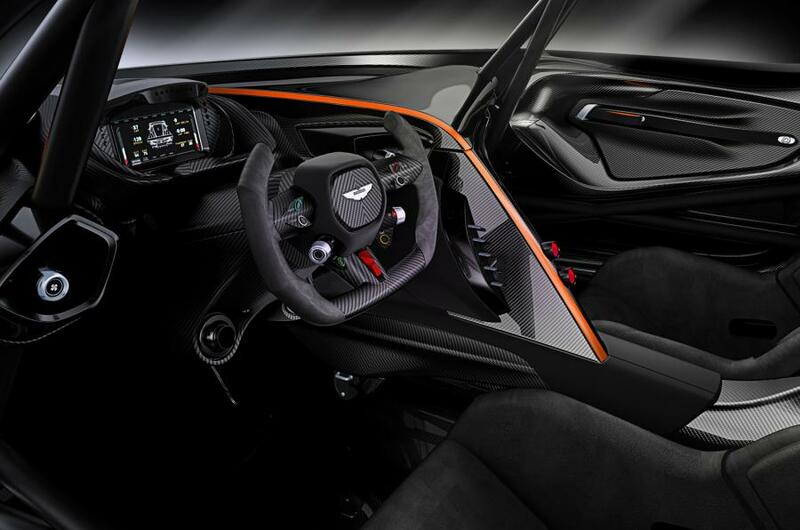 Despite a rather stripped back, race car approach to the externals, Aston has given the Vulcan’s interior a very crafted feel where the cabin is very driver focused and elegant materials have been used. A mixture of Alcantara, leather, carbonfibre, aluminium and titanium make up the driver and passenger areas, while the steering wheel has been bereft of its top half for visibility purposes. The wheel’s shape has helped be determined by Aston’s key racing driver Darren Turner who has had a large hand in ensuring the car’s driving position allows for complete visibility and that the cabin’s ergonomics create an easy environment to work in. 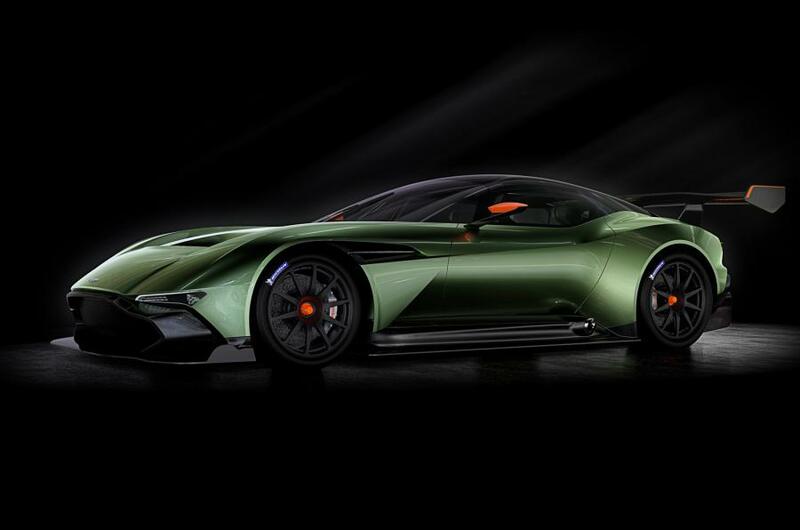 Aston insists no two Vulcans will be the same thanks to a huge amount of available customisation. Meanwhile, a full driver training programme will allow customers to get the most out of their Vulcan, with track days in not just in the £1.8 million car, but also the V12 Vantage S, One-77 and Vantage GT4 racer to hone their skills at the wheel. The Vulcan itself can be completely customised for track in regards to brake biases, suspension set-up and electronic driver aids; meanwhile, the car’s power can be restricted and the tyre choice can be altered whilst building up driver ability. 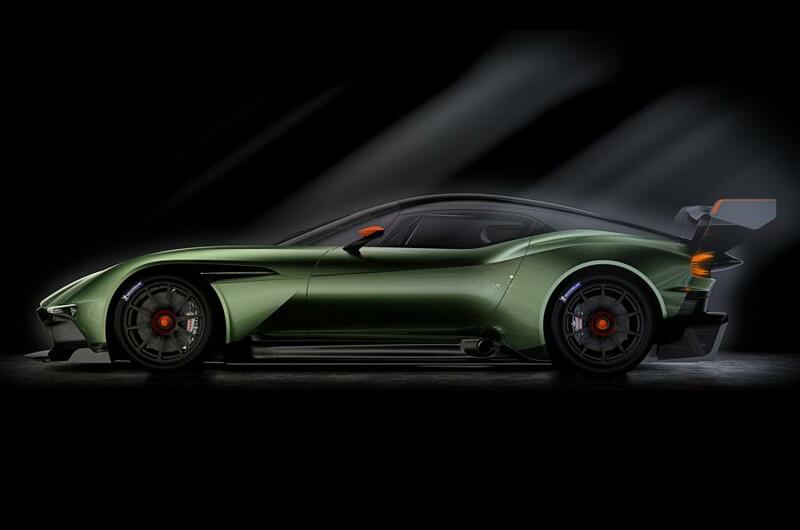 Although touted as a track-only vehicle, Aston will allow customer to ‘single type approve’ their car if they see fit, with Aston supplying items such as lights, handbrakes and wiper after engineering the Vulcan to accommodate these additional parts. Apparently most of the 24 examples have been spoken for, but we’ll be there for the Vulcan’s full unveiling at next week’s Geneva motor show and we’ll be sure to supply as much ‘live’ imagery as possible on the day.